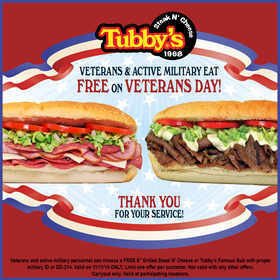 ROSEVILLE, MI--(Marketwired - Oct 27, 2014) - Tubby's Sub Shops, www.tubbysgrilled.com, will offer all veterans and active duty military the choice of free carryout of its popular six inch Grilled Steak N' Cheese or Tubby's Famous Sub on Veterans Day, Tuesday, November 11, 2014. "This is a small way in which we can honor and show appreciation to veterans in service to our country," said Robert Paganes, Tubby's CEO. All veterans -- including active duty, retired or former U.S. military with a military ID or DD-214 are eligible for this free offer available during normal store hours on Tuesday, November 11, 2014, at any of Tubby's participating locations throughout Michigan. One offer is available per customer. "Without the work of these fine men and women, we wouldn't be able to enjoy the many freedoms we have," added Bill Kiryakoza, executive vice president of Tubby's. "We want to thank our brave veterans and military personnel for all they have done to keep this country safe." For more information and to find a Tubby's Sub Shop near you, visit www.tubbysgrilled.com.